When we receive a file from you, the first thing we check is whether there are colors other than CMYK in the file. If the file is built exclusively in CMYK, it will be sent directly for proofing. If we have only received CMYK data from you, we will ignore all input and output profiles and only use the CMYK values that we bring to the ordered output color space. Example 1: Data in ISOCoated, proof in ISOCoatedV2 ordered, thus wrong or no CMYK profile embedded. 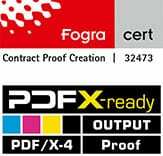 You send a file with the profile ISOCoated and a color area in CMYK 100/70/0/0 and order a proof according to ISOCoatedV2. We ignore the ISOCoated profile and proof the pure color value 100/70/0/0 according to ISOCoatedV2. In our proofs, we try to reproduce the “lived reality” of the print as well as possible. In many conversations with printers we have seen that in almost 100% of the cases they do not convert profiles from CMYK to CMYK, but instead put a colour value of 100/70/0/0 on the plate without taking CMYK profiles into account, insert paper and print in conformity with the standards. So we also map this way, although it would actually be “more correct” to perform a color space transfer from ISOCoated 100/70/0/0 to ISOCoatedV2. However, this results in a different color value, for example 100/63/1/6 for relatively colorimetric conversion with depth compensation or 100/63/3/15 perceptively with depth compensation! One of our customers did not proof 30 slightly different, dark blue colour areas in ISOCoatedV2 on our premises, but on the premises of a colleague, under each of which the CMYK value was in black lettering, in order to sample the colour of a powder-coated surface. The customer defined a very well fitting CMYK colour value on the basis of the proofed colour areas, inserted it into his brochures and started the print jobs. Result: The dark blue was a distinctly different blue than on the reference proof, customer and agency were very dissatisfied and went on troubleshooting. Now the case came to us. We received a file for proofing according to ISOCoatedV2 and compared it with our colleague’s proof. The colors with the same black CMYK values printed underneath were clearly different, but both proofs were provided with media wedges and measured correctly. After some troubleshooting, we came up with the idea of requesting the original proof from our colleague, which also existed. In this one there was a Fogra27Coated profile, thus an implementation of the old ISOCoated. A proof according to ISOCoatedV2 had been ordered at that time. Had it happened? The colleague had taken the input profiles into account, which resulted in a significant change in the CMYK values of the color patches, as mentioned above, due to a color space transfer from CMYK to CMYK. The black printed CMYK values under the color patches had of course not changed. The patterned CMYK value therefore did not correspond to the proofed value at all. Our customer fell from all clouds: “How, our CMYK values were not proofed”. This would not have happened with us, because we would ignore the embedded profile with CMYK data. In this case this would also have been our customer’s expectations.